I was enjoying the view of the water when I hit her with my car. A small flock of brown-headed cowbirds swooped across my windshield then banked right. Just as the last bird banked my windshield smashed into her. The windshield didn’t deflect her. She wedged under my wiper, where the hood meets the windshield. Her winged fluttered in the 30 mile an hour wind, softly beating on my windshield. Fall off. Just fall off . But she didn’t fall off. I pulled over and pick her up. Her wing was awkwardly bent, but she breathed. What do I do? Put her on the ground? Put her out of her misery with the heel of my shoe? I put her in my lap and drove to the grocery store. She lay on my wet swimshorts, breathing with closed eyes. I hoped she would die to end her pain and to assuage my shame. It was an accident. 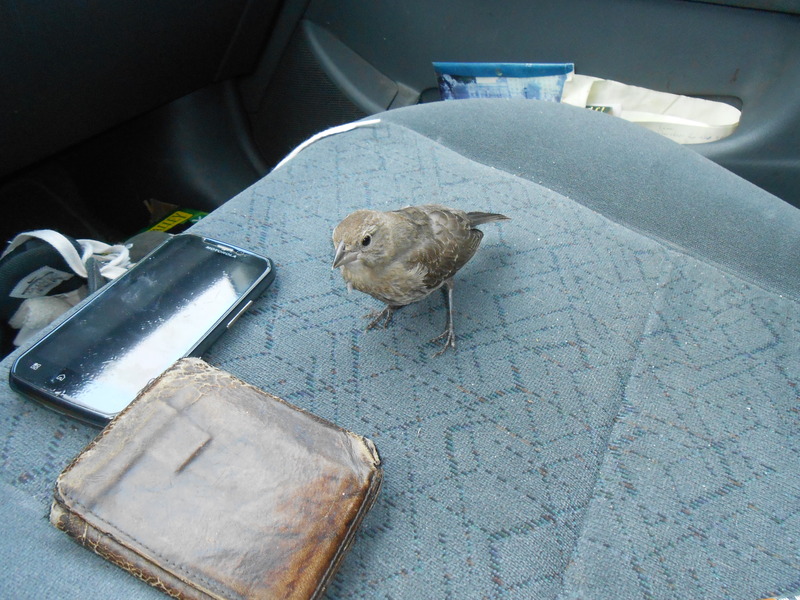 When I went over a parking lot speed bump she chirped and stood up. Maybe she was okay. I’d seen a hummingbird slam into a window and then get up ten minutes later like nothing happened. I put her on the passenger seat. She stood there breathing with her eyelids falling like a sleepy kid trying to prove he’s not sleepy. I went in the store. I left the car on with the AC going and the Beach Boys playing. She was still on the seat when I got back. I ate my store-bought soup as we listened to “Wouldn’t it be nice”. How many birds glance off windshields and roll into the street, not quite dead, and soon die from the heat or the cold or the ants that start with the soft spots of the bird first? To die alone seems a tragedy. I was now responsible for her last bit of living. I wrapped her in a dirty tee-shirt. We drove around listening to the Beach Boys until she breathed no more. Out of evolutionary efficiency, brown-headed cowbirds never make nests. A female lays her eggs in the nests of other bird species. Unaware of what has happened, the ‘host’ mother raises the ‘parasite’ brood as her own, leaving the female brown-headed cowbird to lay more eggs in other nests. The most famous brood parasite are certain species of cuckoos. To fans of warblers, song sparrows, red-winged blackbirds, and any of the other 140 host species that are duped into raising someone else’s kids, brown-headed cowbirds are inglorious dastards beyond scruples. But are their morals less than those of parents who use any means necessary to provide for their offspring? Evolution has made them efficient brooders, but at the cost of a kinship with their young. …ahem. now i’m stuck. i don’t know how to end this essay. i don’t have a clever existential ending about fleeting life, parenthood and beach boys. i hit a bird. i felt bad. the bird died. i learned it was a clever bird hated by some who love birds. i am still struck by the bird’s clever ways.